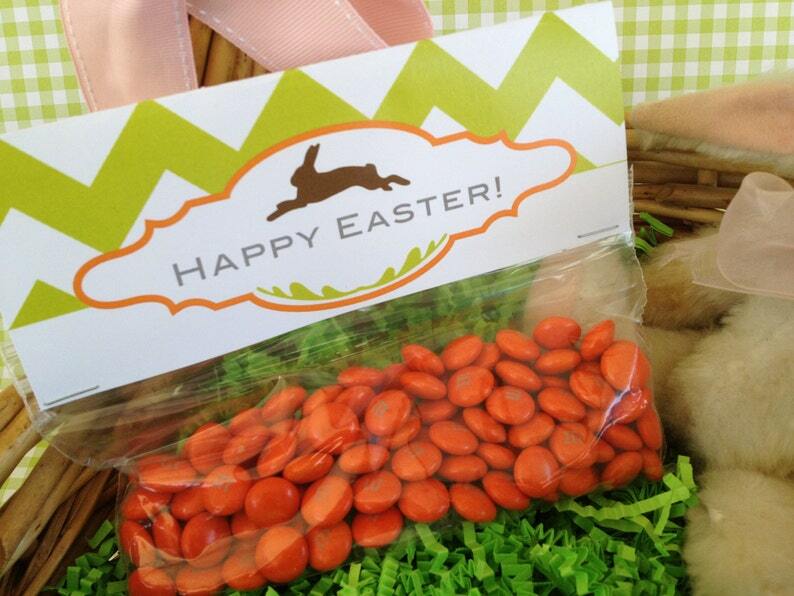 Perfect if you want to divvy out bags of Easter candies into charming individual treat bags! This listing is for 2 PDF files which will be available for immediate download once Etsy confirms payment. .. one with the grey gingham background and one with a green chevron background. ..one with a pink gingham background and the other with orange polka dots. All four designs can be seen in the listing photos. You will need adobe acrobat reader to open the file. I recommend printing on card stock. Trim marks indicate where the labels should be cut. Rectangles will be roughly 6.375" wide x 5" tall when cut out. Fold in half length-wise and attach to baggie with double stick tape and/or staples. Print as many as you like, but these are for personal use only. Rights to resale or share the file or to resale the printed images are not included with this purchase.